and a very merry unbirthday to me! you'll be happy to know i'm enjoying my unbirthday very much, especially now that i have the house to myself. thank you for the wishes! Happy, happy BIRTHDAY. Enjoy it! Ah cool! It’s my birthday too! Happy Birthday! Happy birthday, Celia! Have a great day and I hope you got those books you were hoping for! 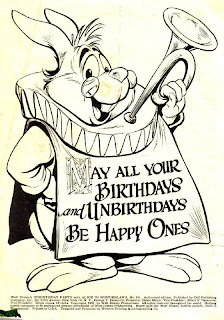 Why...why it's my unbirthday! How did you know? Happy birthday and have a wonderful day! A BIG HAPPY BIRTHDAY to you!!!!! Hope you had a wonderful day! Happy, Happy Birthday! May you get lots of presents. Happy happy birthday! I hope your day was perfect! Yay birthday! Happy one to you! And may all your birthday wishes come true. A very happy but belated birthday to you! And a Happy New Year! Happy (belated) birthday to you! I had a fun time the other night and I hope your travels are going well. Happy belated birthday to you!! You share a birthday with my Grandboy (just turned 3), so it's a lovely day to celebrate, whichever way I look at it! LOL! You are too funny. Happy Birthday. :) And a Happy New Year!! I am so sorry I missed this on the day. Well, happy belated birthday, or unbirthday since I'm late. "I'm late, I'm late...for a very important date. No time to say hello, goodbye, I'm late, I'm late, I'm late!" A very happy belated birthday to you and a good, better, best 2010!